"Located southwest of Bordeaux in the commune of Haux, Château Lamothe has crafted estate-bottled wine since the 16th century. For four generations succession was passed down on the mother's side and since 1956 the estate has been run by the Néel-Chombart family. Over the past 60 years the family has amassed prime vineyard land which now spans 80 hectares of clay and limestone slopes on the Right Bank. 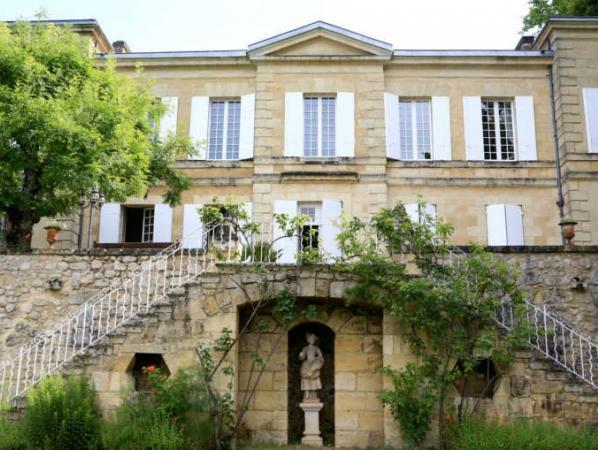 Additionally, they restored the distinctive façade of the historic chateau (now pictured on all Lamothe labels) and renovated the 17th century limestone quarries into underground cellars ideal for ageing. Vigneron Damien Chombart believes that sustainable farming is not only stewardship of the land, but also as a way to enhance the life of farmers, communities and society. It is a holistic challenge the connects economic success in agriculture with environmental and social responsibilities for all involved. To that end, the Néel-Chombart family works to achieve optimal soil health and also encourages biodiversity in the vineyards by implementing a variety of supporting measures to protect flora, birds, beetles and earthworms. The presence of "Bee Hotels" on the property provides a safe haven for wild bees and other pollinators to nest and seek protection from bad weather. In conjunction with these efforts, the family has adopted a biological treatment system for wastewater management. A large portion of Lamothe plantings contributes to the Bordeaux Blanc, which has garnered a following around the world. It is comprised of 40% Sauvignon Blanc, 40% Semillon and 20% Muscadelle, a uniquely high percentage that accounts for the intensely aromatic profile of this stellar value. In addition to both reds, which are a traditional blend of Merlot, Cabernet Sauvignon and Cabernet Franc, the family crafts a vibrant and succulent dessert wine from the appellation of Cadillac at their neighboring estate, Château Manos. We are thrilled to include both Château Lamothe and Château Manos as part of our portfolio of lauded Bordeaux growers." Wine Enthusiast 91"This is a fine wine, with wood and fruit both rich and concentrated. It has spice, juicy black fruits and ripe tannins. It is developing slowly and surely and will be ready to drink from 2019. Cellar Selection."